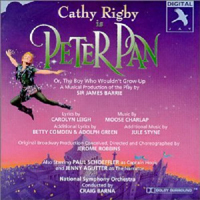 Studio Cast, 1997 (JAY) (3 / 5) Despite its difficult aerial demands, the Moose Charlap-Carolyn Leigh-Jule Styne-Betty Comden-Adolph Green Peter Pan has become a stage perennial. Two Peters have fared especially well: Sandy Duncan, who starred in a smash Broadway revival in 1979, and former Olympic gymnast Cathy Rigby, who toured extensively with the show in the 1990s-2000s and headlined four Broadway engagements. While the Duncan production did not yield a cast album, Rigby left both video and audio souvenirs of her performance. And guess what, kids: She’s good! Her voice has much of the sheen of Mary Martin’s, without the coyness, and her characterization is completely valid. “Mysterious Lady,” which always seemed more a Martin showpiece than a fitting part of the show, is gone, but the rest of the score gets first-class treatment here. Alas, Paul Schoeffler as Captain Hook is no match for his energetic adversary — let alone for his predecessor, Cyril Ritchard, whose humor and verve are nowhere to be found here. The rest of the cast is acceptable. The theatrical thrill of the 1954 recording is replaced by a more generic 1990s performance style, but, as even staunch Martin devotees might admit, Rigby soars. — R.B. Television Cast, 2014 (Broadway Records) (2 / 5) The ratings for the 2013 NBC live telecast of The Sound of Music were so high as to make a follow-up inevitable. 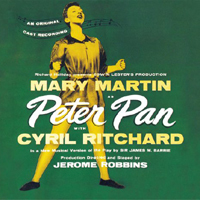 If the choice of Peter Pan was predictable in some ways, it was also a tad perplexing, given the existence (and, now, availability on home video) of three versions starring Mary Martin. In the event, the ratings showed a marked falling-off from TSOM, and the reviews were mixed at best. There were, indeed, several odd casting and staging choices in the production, but it should be noted that it’s far less stressful to listen to this audio recording than to watch the show. Yes, Christopher Walken’s Captain Hook is still monumentally peculiar, but just hearing his odd tones is less disorienting than seeing him as well. 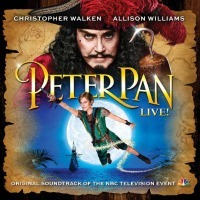 Unlike Walken, Allison Williams can sing, and her Peter sounds appealing, if somewhat generic. As with the aforementioned NBC Sound of Music, genuine musical theater pros were cast in support, here Christian Borle as Smee/Mr. Darling and Kelli O’Hara Mrs. Darling. (Why does Smee, rather than Captain Hook, double in the role of the father? Well, would you want Walken’s Hook for your dad?) Several new songs were added to so-so effect, and there was little surprise that “Ugg-a-Wugg” was given a lyrical overhaul to avoid offense. The “Tarantella” and “Tango” were expanded to amusing effect, but though the recording overall is relatively painless and well done, it’s no match for that superb original cast album. — R.B.